Alongside, there is also an ongoing effort to find substitutes to Silicon(Si). III-V & SiC are promising and have already started displacing Si in applications for power switching, RF amplifiers, and optronics. Also, there has been substantial work regarding the growth of III-V channel on Si. Though pathbreaking, issues have cropped up in this mating due to lattice mismatch & growth techniques among others. Silicon(Si) is also a material of choice for memory devices. Current memory devices store information based on the electronic charge trapped in an oxide or nitride. This charge can leak with time, erasing the stored data. With neuromorphic computing and non-charge based storage being looked into pretty seriously, material substitutes are explored to silicon. The material under consideration is vanadium oxide(VO2) which exhibits Metal-Insulator Transition(MIT) ie. the material is an insulator at room temperature but starts to behave as a conductor at temperatures exceeding 68°C. This kind of material can be utilized for storing data and memory programming. They fall under the category of Phase Change Memory(PCM). Researchers at EPFL have used reactive magnetron sputtering to produce GexV1−xO2+y films which have a transition temperature of ~95°C. 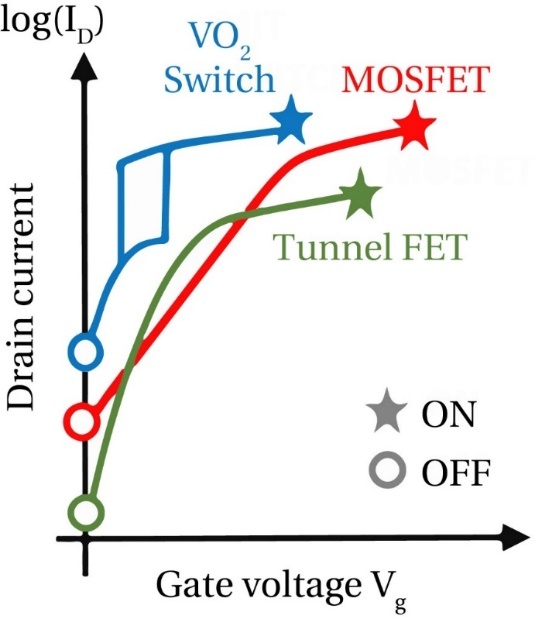 In the future, post optimization, vanadium oxide(VO2) based devices can be fabricated as a part of the CMOS backend flow owing to a low-temperature fabrication giving direct access to the memory cell using the on-chip transistor.